JS++ is now available for GitHub’s Atom text and code editor. Atom integration will be packaged into the next release of JS++; however, if you wish to download immediately, please download the code from the GitHub repository. 1. Navigate to the Atom packages directory. 2. Copy the “language-js-plus-plus” folder into the Atom packages folder. As usual, we remain committed to maximum integration across IDEs and editors, and we’ve repeatedly proven our ability to execute in this respect. JS++ is now fully supported in UltraEdit. The UltraEdit wordfile can be downloaded from GitHub. 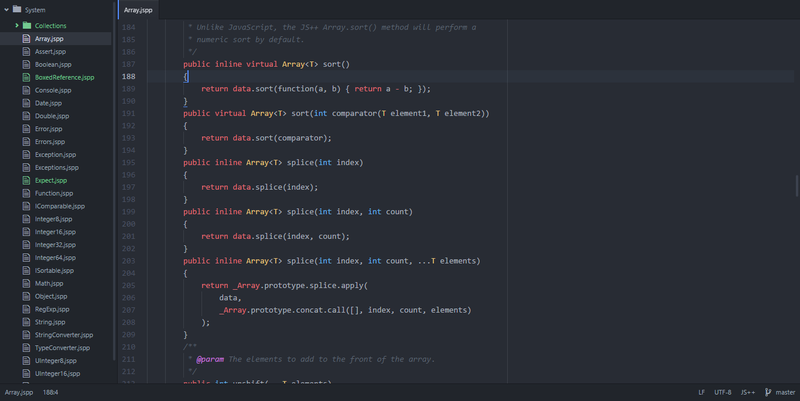 Syntax highlighting, code folding, and more are supported in UltraEdit. 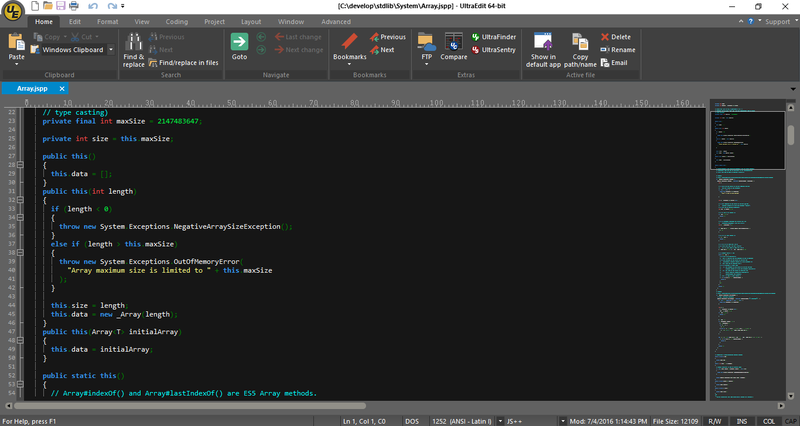 The UltraEdit wordfile will be distributed with the next release of JS++. At Onux, we are fully committed to maximum editor & IDE integration. Within the span of two weeks, we integrated JS++ into three of the most popular editors: Sublime Text, Notepad++, and vim. We now have support for UltraEdit and there is still more to come! 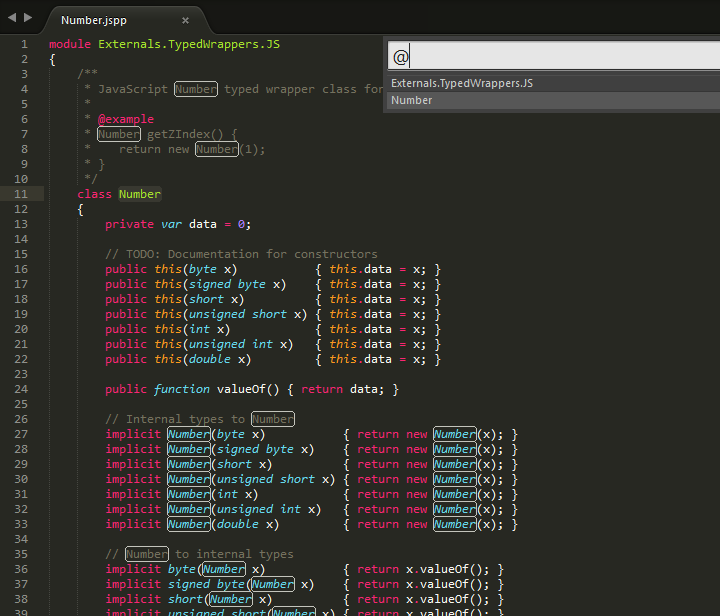 Sublime Text now fully supports JS++. 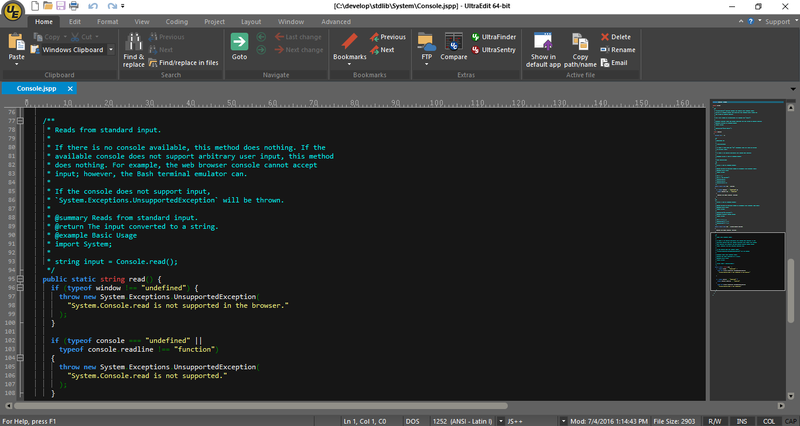 Editor integration is provided and tested for both Sublime Text 2 and 3. JS++ support for Sublime Text extends to the whole nine yards: syntax highlighting, code folding, build system integration with error locations and navigation, symbol navigation, documentation generator support, and more. As with all the previous editor integrations, the JS++ Sublime Text integration will be distributed with the next version of JS++. We want to re-state Onux’s full commitment to providing maximum editor and IDE integration. In the past two weeks alone, we have provided full editor integrations for three of the most popular code editors. You can download the Sublime Text plugin from GitHub.